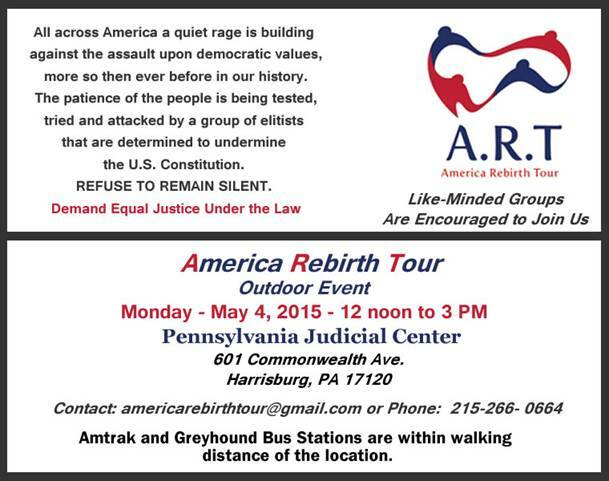 HARRISBURG, PENNSYLVANIA — On Monday, May 4, 2015, Pennsylvania Court Watch and a coalition of organizations working toward judicial restoration in the form of constitutional restoration will hold a rally in front of the Pennsylvania Judicial Center at 601 Commonwealth Ave. in Harrisburg Pa. from noon to 3 p.m. to demand that the judicial branch be brought under the same legal standards of transparency and accountability as other branches of government. 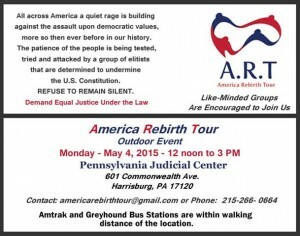 Entertainment and organizing provided by America Rebirth Tour (A.R.T.). We are demonstrating in response to decades of abuse and miscarriages of justice that have been heaped on the people of this great state: the lack of due process and unequal treatment in criminal and civil courts, rampant legal abuse in family courts in backroom deals, and other injustices, all due to a lack of outside oversight. “The law holds that it is better that ten guilty persons escape, than that one innocent suffer,” wrote William Blackstone. We, the people, who are the government, must demand justice, and if those demands are not met, we must hold those we have elected to represent us accountable for their actions. With the rise of the school-to-prison pipeline and the criminalization of the poor, too many have suffered. Americans from all walks of life are fed up with the lack of transparency and accountability within the judicial system. Having a branch of government that makes rules for itself, and then interprets them, is a recipe for disaster. Additionally, that same body is operating behind closed doors, creating a system of lawlessness.